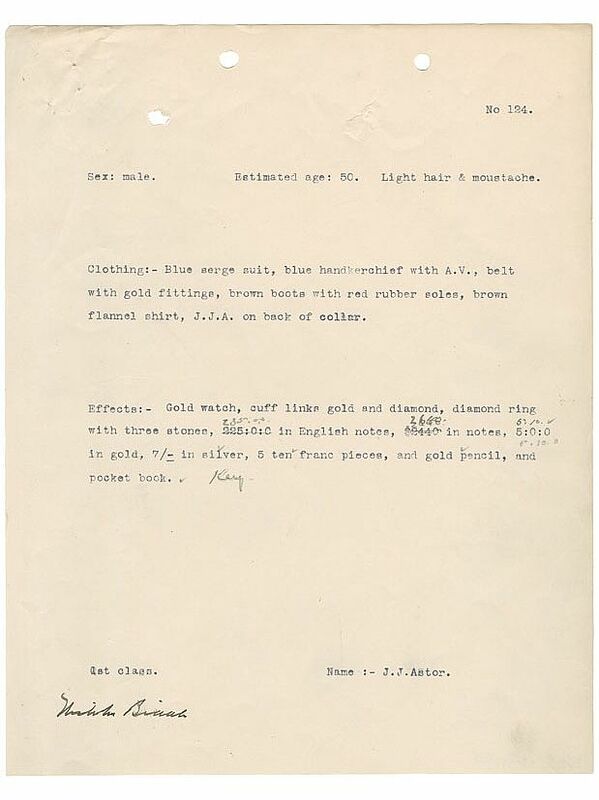 1,555 pages of documents related to the recovery of Titanic victims at sea. There were approximately 2,224 passengers and crew members onboard the RMS Titanic on April 14, 1912, 11:40 pm when the ship hit an iceberg 375 miles of the south coast of Newfoundland. By 2:20 am, April 15, 1912 when the liner sank, their fates as Titanic passengers, the 705 survivors and over 1,500 fatalities, were delivered. The RMS Carpathia is famous for rescuing survivors from their lifeboats in the frigid North Atlantic Ocean waters. Less famous are the CS Mackay-Bennet and CS Minia, the ships that retrieved the majority of the fatalities that could be found at sea. Two days after the sinking of the Titanic, White Star Line chartered the cable ship (CS) Mackay-Bennett, which was based in Halifax, Nova Scotia. The company soon hired additional Canadian ships, the lighthouse supply ship Montmagny, CS Minia, and the sealing vessel Algerine. To carry out its grim task, each ship was outfitted with embalming supplies, coffins, undertakers, and clergy. Out of the 333 bodies found at sea, 328 were found by Canadian ships. The rest were found by ships passing through the North Atlantic. The MacKay-Bennett recovered 306 bodies, of which 116 were buried at sea and 190 brought into port. The CS Minia recovered 17 bodies, of which 15 were brought back to Halifax. The Canadian Government Ship (CGS) Montmagny recovered 4 bodies, one was buried at sea. The SS Algerine recovered 1 body. The bodies recovered at sea included the American John Jacob Astor IV, who was the richest person onboard the Titanic, Isidor Straus, owner of Macy's Department Store and architect Edward Austin Kent. Soon the Mackay-Bennett was running out of embalming material. The ship could only return the bodies to Canada if they were embalmed first. This lead to the Mackay-Bennett's captain Frederick H. Larnder deciding to only bring back to the shore the bodies of first class passengers. The others were buried at sea. The bodies brought back to Halifax were taken to a temporary morgue set up at a curling rink. 1,285 pages of reports assembled by the Medical Examiner for the City of Halifax and Town of Dartmouth concerning the 328 Titanic victims that were recovered by ships operating out of Nova Scotia. The documents illustrate the efforts to indentify unidentified bodies. 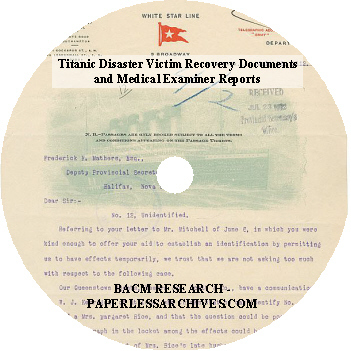 Each report contains at least a one page Medical Examiner's record of each Titanic victim, listing identity if known, gender, physical characteristics, estimated age, clothing, passenger class, and personal effects found on the body. Some reports contain additional documents such as letters to and from White Star, and information about the returning of effects to next of kin and the identities of the bodies. The pages of the reports contain handwritten notes and corrections. The first victim recovered at sea was Walter John Van Billiard, thus he is given the identification number one. He was a nine year old boy described as having light hair. The report describes him as wearing one grey coat, one blue coat, grey woolen jersey, white shirt, grey knickers, black stockings and black boots. Effects found on his person were a purse containing few Danish coins, a ring, and two handkerchiefs marked "A". His body along with the body of his father, Austin Blyler van Billiard, was returned to his grandparents in North Pennsylvania for burial. His older brother, 10 year old James William van Billiard, remains were never identified as recovered. This 23 page report was prepared by the Halifax Provincial Secretary's Office. It contains an account of the 328 Titanic victims found at sea. The registry is in alphabetical order and list if known, name, body identification number, distinguishing physical features, clothing, personal effects found on the body, and the disposition of the remains. 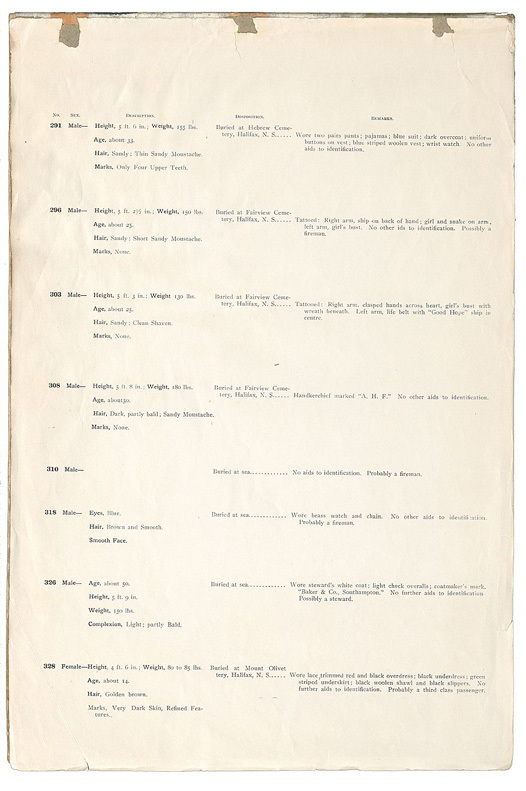 This report is in two sections, List of Bodies Identified and Disposition of Same, and List of Bodies Unidentified and Disposition of Same. 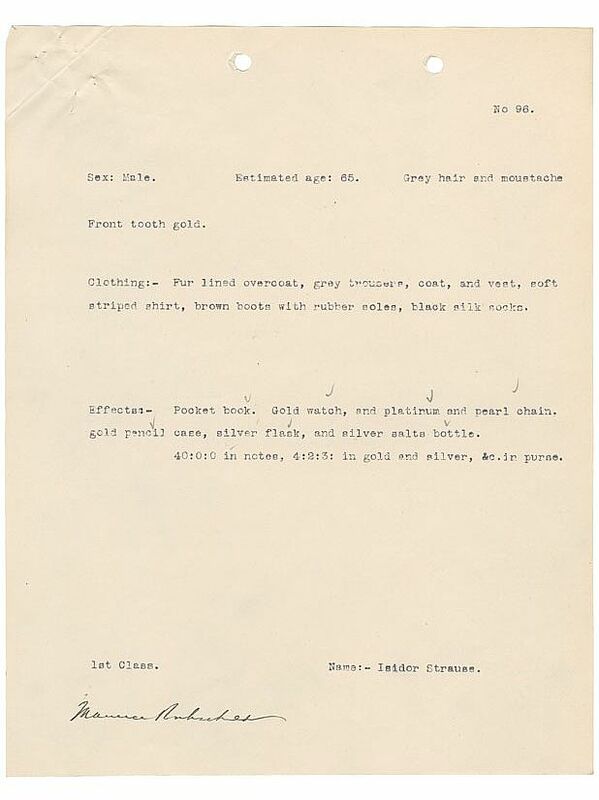 This document was based on information available at the time it was produced. 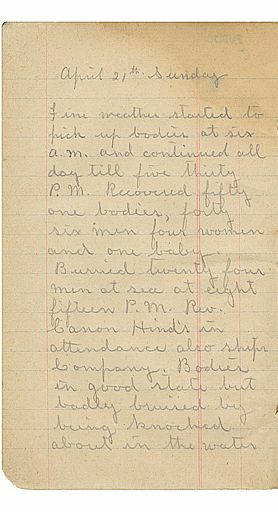 Seven pages from the diary of Frederick A. Hamilton, cable engineer, whilst aboard the CS Mackay Bennett, recovering corpses after the loss of the Titanic. An 11 page journal containing 7 pages of diary entries record by Clifford Crease from April 17, to April 30, 1912. Crease worked on the Mackay-Bennett telegraph cable laying and repair ship as an artificer, a craftsman-in-training. His diary is a straightforward account of the ship's task of recovering the bodies of the Titanic Disaster victims. 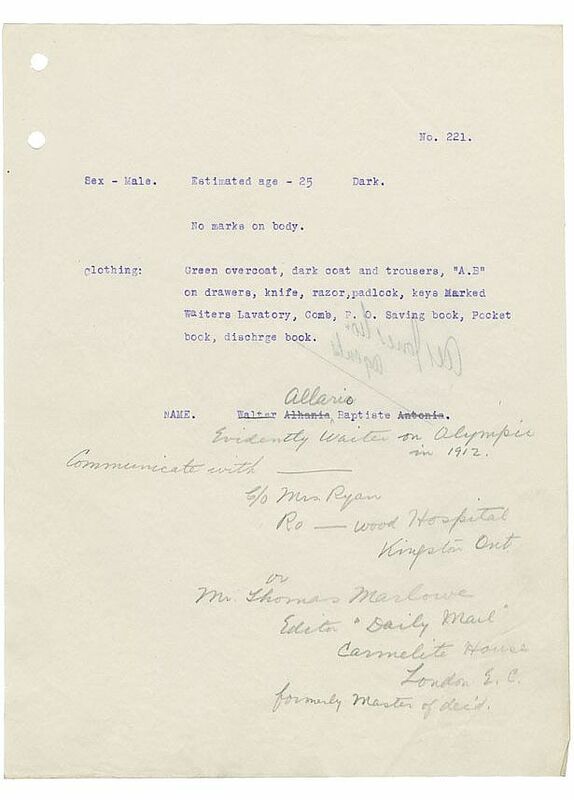 RECORD OF BODIES AND EFFECTS (PASSENGERS AND CREW SS "TITANIC") RECOVERED BY CABLE STEAMER "MACKAY-BENNETT" INCLUDING BODIES BURIED AT SEA AND BODIES DELIVERED AT MORGUE IN HALIFAX, N.S. This 79 page report includes two typed pages with handwritten notations added loosely at the end for numbers 307 - 330, bodies retrieved by the CS Minia, CGS Montmagny and SS Algerine. The report skips numbers 324, 325 and 326, although other reports include a file for #326, an unidentified body. 114 article clips from the Chronicle Herald of Nova Scotia. These clips give a chronological look at the events and the impact of the burden inherited by Nova Scotia, as the guardian of the dead of the Titanic Disaster. The articles cover the work of recovering bodies at sea by the Mackay-Bennett and other recovery ships; the return of deceased Titanic passengers and crew to land. Events surrounding the return of remains; Accounts by family members of lost Titanic passengers arriving in Halifax, details about the burials at sea and land of Titanic victims.